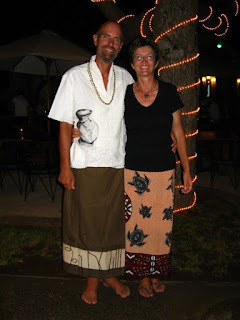 Angus & Ruth Ross-Thomson have been cruising aboard ‘Do It…’ since April 2005. 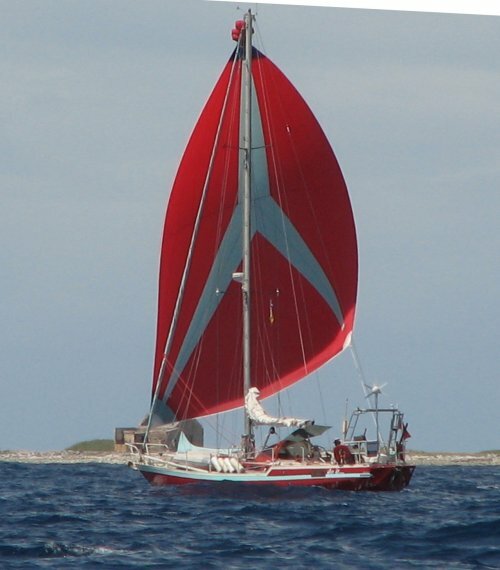 Do It is a steel cutter rigged monohull, a Subrero Petit Prince, 12.5 metres (41ft), hailing from Portsmouth, UK. 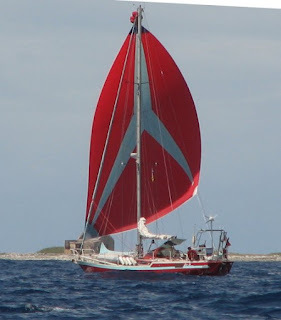 They have completd three quarters of a circumnavigation via the milk run (Europe – Caribbean – Panama – Pacific Islands – NZ/Australia) and are currently in Indonesia heading for Malaysia and Thailand. You can read more about them, warts and all, on their website. Angus: For the crew, a team who has confidence and pride in each other, for the boat, a vessel in which the crew has confidence and pride. Ruth: The ability to slow down. Most cruisers have come from the world of work, where time pressures dominate. When cruising, the only schedule which must be followed is the change of the seasons – avoiding the cyclones/hurricanes. There is no need to dash between anchorages at full speed. If the wind eases, try sailing slowly. It is permissible to progress at less than 5k. It isn’t a race. 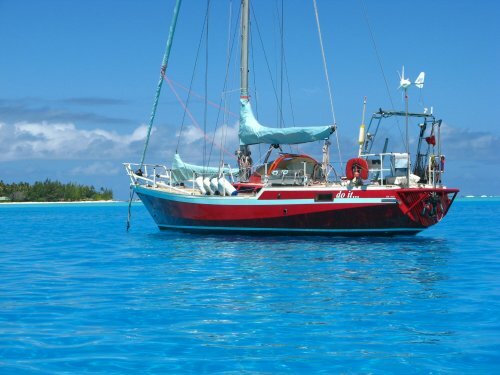 The clearance procedures on many islands are tortuous, long-winded, and may not appear completely relevant to sailing yachts. However, getting stressed and abusive to officials just ruins everyone’s day. Sit back. Relax. OK, the clearance process might take all day – so what? Angus: The Aries wind vane. It has reliably and uncomplainingly steered the boat for tens of thousands of miles at apparent wind speeds down to 3-4 kts with nothing more than the odd squirt of WD40, the odd new bush and some new control lines. Ruth: Looking at my list of three pieces of gear, I realise they all provide us with an increased independence. Sailrite sewing machine - These machines have a well-deserved reputation, being able to stitch through a dozen layers of acrylic canvas or sailcloth. The Sailrite has helped us save money by avoiding the dockside sail makers (some of whom are excellent, others are decidedly less so), however where it really scores is on passage and in remote islands where there is no sail maker. On several occasions the machine has been brought on deck to fix splits or tears. Without the Sailrite, we’d have been faced with long, long periods of hand sewing. Aries wind vane - The Aries windvane is our stalwart third crew member, he never complains about steering 24 hours a day, requires no food (or electricity), and only asks for the occasional new retaining pin. The Aries has even taught us how to trim our sails better. Pactor modem - The Pactor modem, linking our SSB and laptop, has enabled us to keep in touch with friends and family even when we are mid ocean. Of course it also enables us to access the info necessary for the business of sailing – weather forecasts. Angus: “To cruise, it is essential that you have...”. Before we set off. we kept reading about all sort of things that were essential, watermakers, generators, RIBs, huge outboards, biminis, electronic chart plotters, various hull types, various rigs. The most important things would appear to be a reliable boat, a good crew and a sense of fun and adventure. 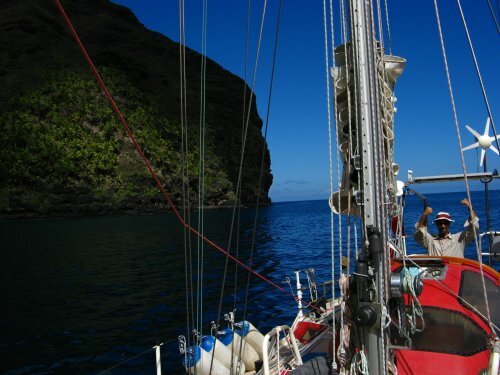 Ruth: The nastiest shock at the end of the Pacific Ocean crossing was discovering that prices in New Zealand and Australia were certainly not similar to those in Pamama – as one leading cruising guide had indicated. Angus: Being rammed while we were at anchor by a short sighted 300 tonne tourist cruise vessel in Puerto Ayora harbour, Galapagos. Just before impact my main fear was that the hull would be stove in and we would loose the rig as the impact point was around amidships by the upper stays. I was wondering how in heck we were going to fix the damage out here in the middle of the Pacific. Fortunately being a steel boat, she took the impact in her stride, keeled over 40 degrees and bounced back with no damage other than bent stanchions and broken guard wires. I still don’t understand why the rig was not damaged. The ship’s Captain was most apologetic and offered to pay for the damage. We were on our way 5 days later. Ruth: During a passage from Tonga to New Zealand, we found ourselves in the path of a tightening depression, along with several other yachts. The radio scheds were alive with news from vessels which had already started to feel the effects of the increasing winds, with over 60k being reported. The anticipation of “violent storm” force winds left me terrified, despite assurances from my husband that the synoptic charts just didn’t support such conditions. As the system passed, the winds never exceeded 35k. I have learnt that whilst the radio can be used to provide support and assistance, it also encourages the predilection of many cruisers to spread bad news. Angus: For the two of us, 3 hours on, 3 hours off, 24 hours a day. The changeover timings (0100, 0400, 0700, 1000, etc) are based on my wife being on watch during the BBC radio soap opera “The Archers” so she could listen in when we were in the UK. We haven’t seen the need to change the timings since. Ruth: We always use a 3 on, 3 off watch system, with my watches starting at 0700, 1300, 1900 and the dreaded 0100. We find this works well for providing a shared time for lunch and supper. Angus: Generally, a varied, community spirited, wonderful people. There are the odd exceptions but they are a small minority. Ruth: The cruising community is as diverse as those individuals who make it up. There are those who are happy spending decades exploring one area, and those set on circumnavigating within two years, there are those who hop from one full service marina to another, and those who spend years at anchor. There is no “right” way to cruise. We find that as the density of yachts in an area increases, the camaraderie decreases. I guess this reflects the difference between village and city living. In general, we find the cruising community to be extremely supportive. Need a widget? Need advice? A call on the VHF will usually bring an answer. Firstly there is the monster shopping trip required to fill the lockers before departing on a long passage, working through the six page list of stores, filling multiple supermarket trolleys, and then trying to figure out how to get everything out to the boat. Then there’s the first trip to the supermarket in a new country. Not looking for what you can buy at home, but seeking out the weird and unknown. Why not buy a can of “Sweat” instead of “Coke”? It may turn out to be your new favourite drink. Finally there are the produce markets, where a little of the local language goes a long way with the village ladies. OK the produce may not look as shiny and uniformly shaped as it does in supermarkets, but boy does it taste good. Ruth: Top of the list must be Cuba. Haven’t you heard about the officials and the paperwork??? Yes, there were many forms to fill in, but all officials came to our boat with smiles, and all brought an assistant to fill in the paperwork. An afternoon for chat and formalities was rewarded with a complimentary Cuba Libre (rum & coke) from the marina. The music, people & culture of Cuba is unique, and certainly worth the effort of half a day of paperwork. Angus: We were happiest about keeping the boat simple and not buying all the latest gizmos and toys. The one mistake was the fitting of a PSS carbon face seal propellor shaft seal. We could never get it to seal properly and removed after three months to fit a Volvo shaft seal which has performed faultlessly for 5 years since. Ruth: Change/choice/compromise happiest with? The choice of yacht for extended cruising is the ultimate compromise. We opted for a steel yacht, thereby sacrificing speed for security. It would be nice to cruise at 7k in a light breeze, however when hitting semi-submerged logs at speed, in the dark, the security of steel is unbeatable. We have met a steel yacht which had spent weeks grinding on a remote reef, awaiting a rescue tow. The boat didn’t look pretty after the experience, but it was afloat and the crew were safe. Change/choice/compromise wish chosen otherwise? We elected to visit Australia for a season to undertake some extensive metal repair work. We didn’t do sufficient research, and discovered that prices, regulations and weather were all against us. A better decision would have been to continue on to Malaysia or Thailand and undertake the work there. Angus: “What is your top tip?”. Keep the boat simple and inexpensive and go as soon as possible. A disadvantage of this approach is that the endless cruiser conversations about how to fix/get spares for the generator/watermaker/chartplotter, air conditioning, etc will be very dull and of no interest. Ruth: “How have you made the transition back to “normal” life?” In 2-3 years time, we will be returning to the UK and will need to make the transition back to jobs, houses, and two-week summer holidays. Much is written about how to prepare for setting off, little about how to return. I have no answer to this question – but would love to know how others have coped with the transition.